The “Stabil Champ” will be played for the very first time at the EHF FINAL4 match between FC Barcelona Borges and Chekhovskie Medvedi on Saturday. Herzogenaurach/Cologne, May 28, 2010 – adidas presented today the new Official Match Ball for the EHF Champions League during a Gala of the European Handball Federation at the Sports & Olympic Museum in Cologne. The “Stabil Champ” will be played for the very first time at the EHF FINAL4 match between FC Barcelona Borges (ESP) and Chekhovskie Medvedi (RUS) on May 29. 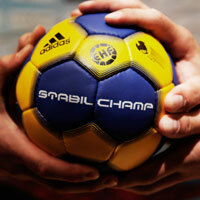 The “Stabil Champ” was exclusively designed and developed for the EHF Champions League. Its design is inspired by the established EHF colours of yellow and blue, whereas the needle punched cover material consisting of a mix of polyurethane foam and polyester provides optimal grip and durability characteristics. The “Stabil Champ” match ball will first be available at the EHF Champions League FINAL4 before it retails at selected stores for €70 from July 1 onwards. “The European Handball Federation is pleased to have adidas continuously working on perfecting its range of handball products including the Official Match Ball. The dedication of our long-standing partner contributes immensely to the development of our game,” EHF Secretary General Michael Wiederer said. “The EHF Champions League FINAL4 is where the best meet the very best and we are proud to be part of the world’s premier club competition. It will be one of highlights in this year’s handball season and we feel it is the ideal stage to present the new Stabil Champ,” added Graham Williamson, Vice President BU Court Sportsat adidas. At the EHF Champions League FINAL4, adidas will not only supply the brand new Official Match Ball, it will also fully equip the team of THW Kiel and debut its latest footwear innovations. In the second match of the semi-final day, Dominik Klein of THW Kiel will play in the lightest ever handball shoe adiZero CC7, while his team mate Filip Jicha presents the next generation of the legendary Stabil series, the Stabil Optifit. For volunteers and fans of the EHF Champions League FINAL4, adidas has designed an exclusive Official License Product Range. adidas and the EHF share a long tradition and have been official partners since the foundation of the EHF. Over the past 18 years, the EHF and adidas have promoted and developed handball across Europe in new and creative ways including special initiatives, projects and equipment support for the benefit of the least developed handball nations. adidas is also the sponsor of the reigning Olympic, World and European Champion France as well Croatia, Germany, Sweden and Russia.